The information you get "wart and all" from a 20 minute conversation is far more than you would glean from any Organisational Guide. I could not be more thankful for the openess and generosity of all of those we have spoken with and the offers of assistance has been hugely appreciated. The one thing that strikes you is that Melbourne can do these events in their sleep. They have infrastructure, experience and skilled people who deliver major events every second week seemingly. We don't necessarily have that luxury, but this week has certainly given us a deeper understanding of what we should and shouldn't be developing on our own. The qualifying session didn't start until 2, but I made a point of getting to the track early to hit up a couple of key targets in the electronic timing area and also grab some time with one of the Event Directors Paula Ewing. These catch-ups were worth the price of admission alone (as they say). We also spent some time in the Drug Control area with UCI's Magali Louis who gave us an overview of the testing requirements - again, seeing the set-up first hand makes such a difference. Fortunately we weren't tested for caffeine as I suspect all of our levels would have been off the charts. Having kick-started my New Year with something of a health and exercise crusade I was a bit worried that I may slip off the rails whilst away - but the great thing about Melbourne is that you can walk everywhere. So by the time you wandered in for brunch/lunch and then between sessions for some fresh air you have walked for 90 minutes or two hours without realising it. Dale took this to the extreme by walking to the Arena, realising she had left her accreditation at her place, and walking back, before repeating the journey. Don't worry DT the keirin heats weren't that interesting anyway! Oh that's right ... they were. Again the standard the the fields was incredible. The Kiwi boys, Simon van Velthooven, Matt Archibald and Eddie Dawkins all competed well but with only the heat winner taking the direct route to the semis it was a pretty tall order - Eddie shared his heat with GB's Jason Kenny, France's Mickael Borgain and Japan's Kazunari Watanabe (who won the heat). In the repechges, Simon got the business done to make the semis while Matt earned the "hulk of the competition award," snapping his seat post and having to ride the last one and a half laps with a busted seat. Eddie couldn't quite hold off German Max Levy and was unlucky to bow out of the competition. In between keirin rounds, Ali Shanks qualified for the Individual Pursuit with a blistering 3:27.268 to confirm a ride for gold against Wendy Houvenaghel of Great Britain in the competition's final session. Between sessions we caught Eddie and Matt on their way back to the team hotel. They were deservedly pretty satisfied with their efforts. In that company, to place 7th and 12th in sprint qualifying is a PHENOMENAL effort. Back to the racing and what a way to start the final session - Ali Shanks wins gold, leading from start to finish. It doesn't matter where you are in the world, to watch a NZ flag being raised and hear the anthem being played is something pretty special. All class. 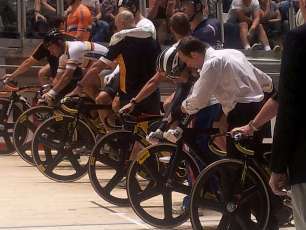 Moments later, Simon qualified for the Men's Keirin final, placing third in his second round round ride. A brilliant effort and he looked so at home at the highest level. 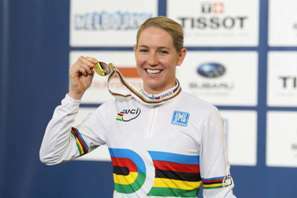 The Women's 500m Time Trial again showed Anna Meares' class. The Aussie sprint queen smashed the world record to record 33.010 to win by an incredible six tenths of a second. Tarsh's 35.090 put her 16th, a couple of places behind Katie Schofield. Then came the most gutting result of the championships. Simon fought his way to third across the line in the Men's Kerin final behind Sir Chris Hoy (whose move down the inside in the final straight had to be seen to be believed) and Max Levy. Unbeknown to all of us in the venue he was then relegated for entering the sprinters lane when Jason Kenny was already there. The first we knew about it was when Kenny stepped on to the podium to receive the bronze. Gutted is the only word to describe that result as the man they call Rhino made all the the moves in the final and made it one of the great races - only to be relegated for his efforts. 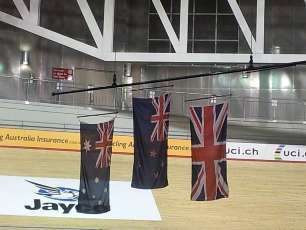 The championships ended with Belgiuym earning a dominant victory in the Madison, over Great Britain and Australia. So New Zealand ended the champs with five medals - the same number as Germany with only Great Britain (13) and Australia (15) ahead of them. Now we wait for the naming of the Olympic team in ten days' time. There is plenty for the selectors to consider and New Zealand will travel to London knowing that while they have work to do, they have a realisytic shot at returning home with multiple medals. A special thanks to Steve and Dale for their outstanding endless work during the trip and to all of those involved in the 2012 Worlds who gave so freely of their time and knowlege. Being part of an event with so many different cultures and nations represented has really lit the fire for our Junior Worlds in August.